An injector is a game tool that allows the user to inject either COBs or agents into the game world. In Creatures and Creatures 2, the injector is in the form of an applet. It is known as the Object Injector or the Injector Kit. The original Object Injector did not allow players to remove items from their world. To bypass this, cobblers would include a second .COB file with their object with the remove scripts. An update was provided which included support for RCB files. The GOG.com edition of Creatures 1 includes the original Object Injector. To use the update, the Creatures Remastered Patch must first be applied. In the updated kit, COBs which do not come with an RCB file are marked with an asterisk. In Windows 10, the Injector Kit does not function. 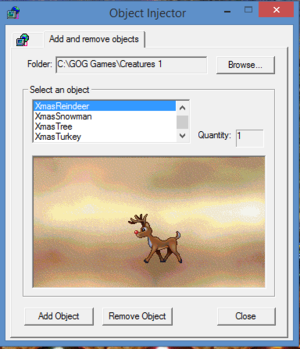 However, Creatures Object Editor can be used to inject COBs into the world. In Creatures 3 and Docking Station, the agent injector is an agent for injecting other agents in the form of PRAY files into the world. To use it you can use the up and down arrows to cycle through agents, the large blue button for injecting agents, and, if you are using the latest update, a button with a cross on it which toggles removing/adding agents. On the left of the injector you can see three main items: a bar which tells you the name of the agent OR the efficiency of the machine, a blue banana-shaped bar which indicates how long you have until you can inject the agent (you can only inject when this is at full), and a door which opens to eject your brand-new agent. In Docking Station, there is a tab in the Comms Room that allows you to select and inject agents into the world. Sometimes you will have more agents in the Docking Station/My Agents folder then can be listed in one page. all the agents are listed on a page-by-page basis. to switch between pages use the two arrow buttons below the window. When you want to inject an agent(or a meta-room) just double click it's name. if the agent you have tried to inject is faulty, then DS won't inject it and instead display an error in the box beside the agent list. you can inject any agent at any time and your brand-spankin' new agent will appear in the bottom left of the room. Beside the agent info box is a stub that has the C3 logo on it. Click it and you can inject agents designed for C3. Sometimes, you need the Agent Room metaroom to do this because there is a certain location designated for C3 Agent injection. Since that location does not exist, it Should go in the Agent Room, albeit behaving weirdly. This page was last modified on 16 November 2016, at 23:05.